For most of us, hunger is short-term, with a simple and foreseeable solution: easy access to a wide array of food and nutrition choices. But for one-sixth of all of the people in the world, hunger is a daily, inescapable reality. The Food and Agriculture Organization (FAO) reports that 925 million people across the world are suffering from chronic hunger, emphasizing that although it has declined for the first time in fifteen years, that number remains "unacceptably high. The risk factors facing malnourished people are dramatic; the results are catastrophic. Estimates indicate that 53% of deaths among pre-school age children in the developing world are due to complications caused by malnutrition on top of diseases such as measles, pneumonia and diarrhea. So, here is another site where you can help people worldwide for free: The Hunger Site. The world has the resources to address all the problems [of hunger] with the technology and the global wealth that exists. However, do we have the will and commitment to do so? The many causes of hunger and malnutrition seem simple; yet ending hunger remains difficult to achieve. In order to understand the elusive solution, we need first to examine the interconnectedness of the root causes of persistent famine and malnutrition. Poverty is at the core of the world hunger crisis. The regions across the world that are subjected to extreme poverty conditions are at more risk to have their terrible situation exacerbated by outside forces such as natural disasters and war/conflict, thereby further deepening their difficult situation. As time goes on, it becomes more and more difficult for individuals, communities, and countries to come out from underneath the heavy blanket of poverty. As the World Food Programme states: "The poverty/stricken do not have enough money to buy or produce enough food for themselves and their families. In turn, they tend to be weaker and cannot produce enough to buy more food." They are caught in a horrible cycle. Natural disasters cause famine, hunger, and poverty in areas of the world that are already predisposed to crisis. In regions where food production and availability is only marginally sufficient to provide a sustainable food supply for its population, this precarious predicament intensifies when drought or other natural disasters wipe out entire crops. Once a region's food production and supply has been severely degraded, it becomes increasingly necessary for that region to import food and supplies. However, many of these countries lack the funding and supportive government infrastructure that will allow for the necessary, life-saving food and supplies to be brought into the country. As significant and devastating as natural disasters are as an impetus for famine, humans and their activities are increasingly responsible for sustained hunger emergencies. Since 1992, the proportion of short-term and long-term food crises that can be attributed to human causes has more than doubled, rising from 15% to more than 35%. All too often, these emergencies are triggered by conflict. We must continue to alleviate the immediate suffering of the hungry by sending food to families in need, but simultaneously we must move toward economic solutions that will end the poverty cycle. The path to long-term life-saving economic stability and growth will come through a concentrated effort by a committed group of world citizens working together to cultivate peace. 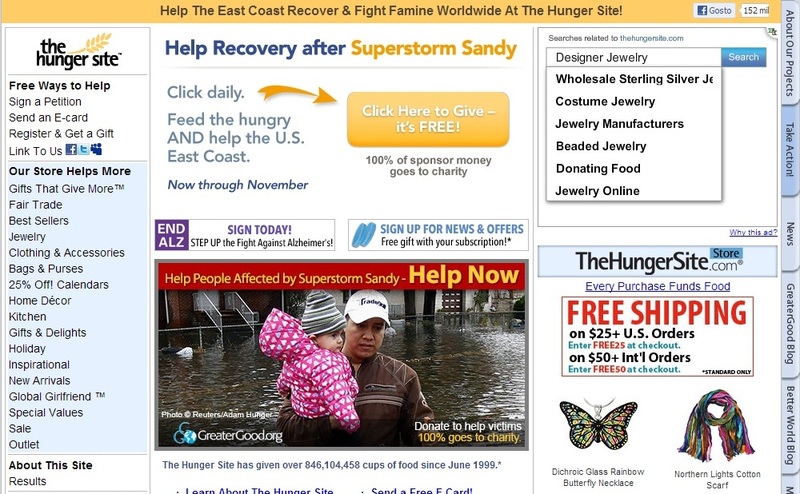 You have read this article citizenship / helping / world hunger with the title The Hunger Site. You can bookmark this page URL http://catolink4.blogspot.com/2012/11/the-hunger-site.html. Thanks! No comment for "The Hunger Site"